I am really excited to announce that I will be hosting Quilting Boot camp right here on this blog for 2013. Just a little background about me. I got into quilting when I was pregnant with my second baby (my son) the summer of 2011. I made 2 baby quilts, a car seat and a stroller cover in 2011. And got totally hooked into quilting. In 2012 I have spent accumulating 100s of yards of fabric dreaming of turning them into quilts. I have so many ideas and techniques which I want to try out and share my experience. I want to put my thoughts into action and wanted to start this boot camp. If you're like me eager to make lots of lots of quilts (at least 12 quilts in 2013) or want to get into quilting this boot camp is perfect for you. Its been an amazing year participating in the SewCalGals 2012 FMQ Challenge along with Leah Days QAL Wednesday. I got to meet lot of wonderful teachers during this FMQ challenge and learned a lot of FMQ, especially feathers. I got introduced to FMQ feathers through Diane Gaudynski, then Cindy Needham and now Patsy Thompson's free-form feathers was icing on the cake. I love all the other tutorials too Angela Walters's Tiles, Leah Day's rail road, Francis Moore's leaf motif and many others. Here are all the outcome of wonderful tutorials bought by all the SewCalGal and all wonderful teachers during this FMQ Challenge. December challenge tutorial was brought to us by the amazing Patsy Thomson. Checkout her tutorial for free-form feathers at SewCalGal's FMQ Challenge. I was making a baby quilt and tried her continuous feathers. Checkout these pictures showing the continuous feathers. These are a modified feathers using Leah Day's swriling petals FMQ design. I had previous blogged about in March 2012. Thank you SewCalGal and Patsy Thomspon for bringing us this wonderful tutorial. This was my first try at needle turn applique and I tried to do the star for the little Christmas Trees. 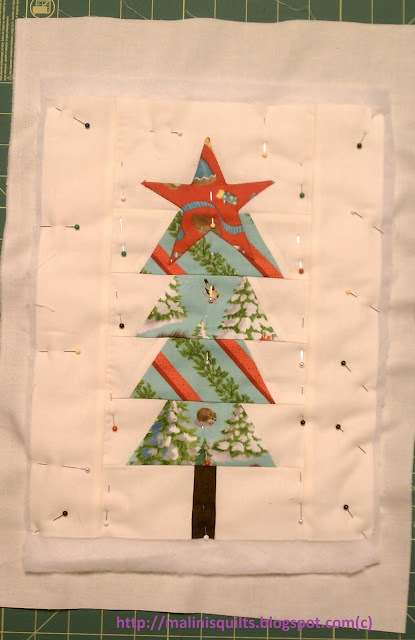 Check this tutorial from Missouri Star Quilt Co & Jan Patek on Needle turn Applique. Wow, these little wall hanging consume so much time if you choose to do FMQ on it. While I was up all night on Thursday along with watching the baby who woke up every few hours, this took me about 8 hours to complete these two after the step below, that is, piecing and appliqueing the stars. But I am really happy with how they turned out. Unfortunately I didn't get to take the picture of the finished wall hangings as I was working on till the last minute. My daughter missed her school bus and I had to drop per off myself. Hmmm.....next time I have to be more careful about the timing and not wait until the last night before the school is off for Christmas. This week I whipped up some quick gifts for my daughters teachers. These blocks will finish to 10x13 inches. I am planning to make these into small wall hangings. I still have to put a start on the top. The inspiration for this project came from my favorite YouTube channel @Missouri Star Quilt Company. I used the smaller half hexie ruler to make the trees. Wow! Its been a month since I have been sitting on this. I had finished quilting this Xs and Os quilt for our BMQG November meeting. And then put the binding on the very next day. But still haven't got a chance to finish it yet. I bet I would be done if I can only get an hour to myself. But I have been working on other projects which I want to finish before Christmas. More pictures to come. You can really see the quilting at the back. This beauty was a tough love. I had my thread breaking quite a few times during quilting. I am wondering did washing my batting cause this. Because I have used the same thread and batting before and didn't have an issue. I was determined though to finish quilting this one. Now linking up to Leah's UFO Sundays. When I was at LSQ couple of weeks ago I saw this new Moda flannel fabrics "Duck Duck Goose", it was love at first sight. Even though I have promised to myself not to buy more fabrics. I had to give-in to my temptation when I saw this fabric line. The flannel is absolutely cuddly and as luxurious as Minky fabrics. And I had the perfect shade of Minky dot fabric to go with. First I was thinking of making a rag quilt, then thought of just simply pieced squares and finally it ended up like this and I love it. Quilting I am thinking of keeping the quilting simple to retain its cuddly and soft texture. I might even use one of the decorative stitch to quilt in the ditch for the Minky fabric, wavy lines in the border and something fun in the blocks itself. This is the only thing I still haven't decided. Have you worked with Minky fabrics in the quilt peicing? Would love to hear your experience on it. Linking up to W.i.P Wednesdays @FreshlyPieced.